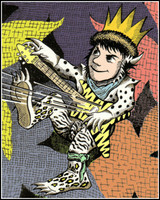 Where the Wild Things Rock kwa Jeff Hopp. rock and roll parody available on Kindle from www.jeffhopp.net. Images in the Where The Wild Things Are club tagged: where the wild things are maurice sendak kindle book jimi hendrix elvis.